I’ve been looking forward to Noah for years, to be honest with you. It’s the first time that director Darren Aronofsky, whose made such films as Requiem for a Dream, The Fountain, The Wrestler, and Black Swan, has been given a film of this magnitude to make. I’ve been hearing and reading about this film for years because this has been Aronofsky’s passion project, his version of the tale of Noah’s Ark. And while many of us cinephiles were very much looking forward to this film, there have been several that haven’t. The problem is that Aronofsky made his version of this biblical story, not the literal word-for-word retelling, and naturally people have been pretty pissed off about it. It’s been heavily scrutinized in the past few weeks from conservative pundits arguing that the film has some sort of agenda politically or some nonsense like that. I’ve tried to tune it all out until the film has been released. Personally, I don’t really care how much liberty Aronofsky is taking with this film. All I want to see is a film that can keep my interest for 2 and a half hours. Well, I just got back from the theater, and here’s my review of Noah. Russell Crowe plays the titular character of Noah, a man who struggles to make his way in this world with his wife and children. In the beginning he was given by his father the snake-skin of the serpent that dates all the way back to Adam and Eve, but he is never given it as his father is killed, and he wishes to seek vengeance one day. When we see Noah as a father, he is given a vision by none other than God himself, that the world will end through a flood due to man’s cruelty, and that Noah must save all the wildlife by building an Ark. The film chronicles that story but in its own unique and original way. I’m still a little confused by all the controversy with this film. Granted, it’s been awhile since Mr. Salinas has been to Sunday school, but for the most part the gist of the story is in tact. I guess that’s not enough, since Paramount very publicly started advertising in their trailers and promotional materials that this is inspired by the story from Genesis, and not the literal telling. Granted, I don’t want to dab too much into this subject, as it’s a sensitive subject for some, and the last thing I want to be writing about is what you should believe in and why, that’s up to you what you believe. But all bias aside with this film, Noah does have some flaws sprinkled throughout the film, and it can be a wee-bit uneven at times, but this is a beautiful looking film that features some terrific acting and set pieces, and it’s honestly one of the best big Hollywood epics of this scale that I’ve seen in a while. Russell Crowe is terrific in the film, and he owns this role as Noah. I like how they portray Noah as a complicated and conflicted man at times, with Crowe given a very subtle performance that never feels over the top or forced. Jennifer Connelly plays Noah’s wife, Naameh (both actors have been husband and wife on-screen before, in Connelly’s Oscar-winning turn in Ron Howard’s A Beautiful Mind). Connelly in the beginning feels like she doesn’t have a whole lot to do and feels like a side character for the first hour. But toward the end of this film, there is a sub-plot that I won’t mention due to spoilers, but Connelly gives it her all in these last couple of minutes. I’d even say that her performance is spot on next to Crowe in this film. We also see some great performances from such esteemed actors like Anthony Hopkins, Ray Winstone, and Emma Watson, who gives a really stellar performance in the film as the wife of Noah’s son, Shem. And while the acting is great and all, I have to tip my hat off to the folks behind the scenes in this film. The visual effects work is phenomenal in the film, along with the sets and cinematography, shot by longtime Aronofsky collaborator Matthew Libatique, and a beautiful score by another longtime collaborator of Aronofsky, Clint Mansell. Even if folks remember just one more thing from the film other than it’s controversy toward the end of the year, it should be the technical achievements that Aronofsky his bestowed on us. If I had to get into the flaws of the film, I’d say that there are rock people in this film. Yes, rock people, called The Watchers. At first they kind of throw me off, but once the film progressed I started to buy it, and it didn’t mind me that much. I also did not like Logan Lerman’s character in the film, Ham, another of Noah’s sons in the film. Granted, that may be the way he was portrayed in the Bible, but his character was whiny and irritating at times. I’m not critiquing Lerman’s performance, he did a good job with what he was given in the film, and he’s a talented lad who has a promising career once he’s done with those damn Percy Jackson films, but I just didn’t like how Aronofsky wrote the character. I also felt that the length of this film, as it’s a LONG film. 2 and a half hours and you can feel it. Granted, with a biblical epic like this you need a running time that’s long, but I feel that Aronofsky could have shed off a couple of minutes from the film. 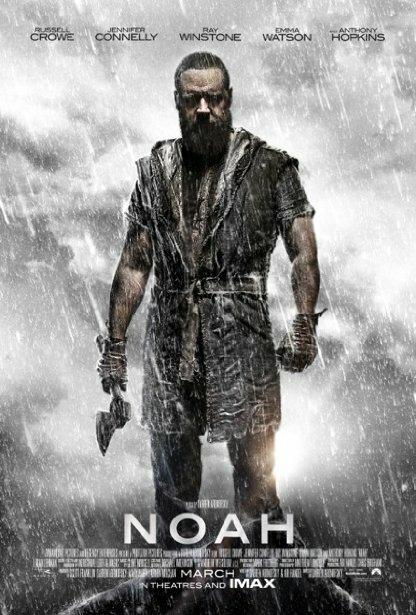 But aside from those complaints, and if you can get past all the controversy surrounding the picture, Noah is a very entertaining film, and one of the best films out in theaters now. If you end up seeing the film I recommend it being in the theater. I don’t think it would hold up as well on a television at home, so a big theater experience is the way to go with this flick. I applaud Aronofsky for making a transition from micro-budgeted independent fare to 9 figure, 100 million plus movies. I hope that the film does make back its money, as it’s a fine film, and a lot better than what’s out there right now. If I were you, I’d go see The Grand Budapest Hotel first, then this if you really wanted to. I’d usually say something to end the review that would preview my review of Captain America: The Winter Soldier, which comes out next week, but I already saw the film, and you can check them out in my previous reviews. Sorry for the humble bragging. March 29, 2014 in Movie Reviews. Have you seen Son of God yet? That one sounds more interesting to me.